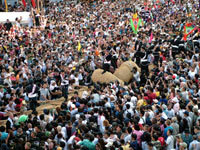 Officially, it is the 3th annual Ryukyu Kingdom Festival Tsunahiki, but everyone on Okinawa knows it better as the great tug-of-war. The center of attraction Sunday afternoon is the 44-ton rope, which brought Okinawa to fame and a place in the Guinness Book of World Records in 1997. The challenge is to keep the world record, which has organizers making it bigger and better each year. Some 300,000 spectators will crowd Kumoji Crossing in downtown Naha for the tug-of-war, with thousands of those‹upwards of 25,000-- getting physically involved in the festivities. A massive parade takes place first, thousands lining Kokusai Street to watch the teams and followers, accompanied by musicians. Ceremonies get under way at 3 p.m., as representatives of four teams from the east and four teams from the west perform a series of martial arts demonstrations. 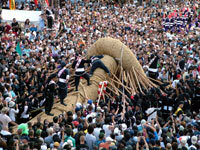 The objective is for one of the teams to move the rope five meters to its side within 30 minutes. It’s not an easy feat. Leaders cry Œyoishi’, O’Shoi’ and ŒHai-ya’, meaning heave ho, or pull harder. For the winning team, it’s bragging rights for a year. Some years the half-hour battle ends in a draw. The tug-of-war itself dates back to 1600, when it served a dual purpose. Villagers from east and west did honorific battle for victory as a sign to shamans who predicted the future. The prayers were for a good rice harvest. The second motive was to instill peace and stability into lives of seafarers, and io insure their safety.